All the world's a stage for the little puppet-turned-performer, Pinocchio. Though bound for school with the best of intentions, Pinocchio finds the allure of the stage too strong to resist, and before he knows it, he's the star attraction in Stromboli's marvelous marionette show. The bright lights and thunderous applause are intoxicating to the neophyte actor, but little does Pinocchio realize that fame comes at a steep price. This character-authentic polystone mini-bust is designed by Patrick Romandy-Simmons and sculpted by Bruce Lau. 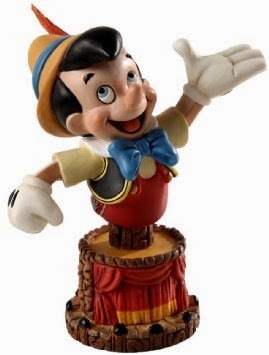 Standing 6 tall and numbered and limited to 3,000 pieces, Pinocchio comes painted and ready to display.